One of the most widely published books in the world, Gone With the Wind, will be met with celebrations of its 75th anniversary throughout Atlanta, and other locales, in 2011. 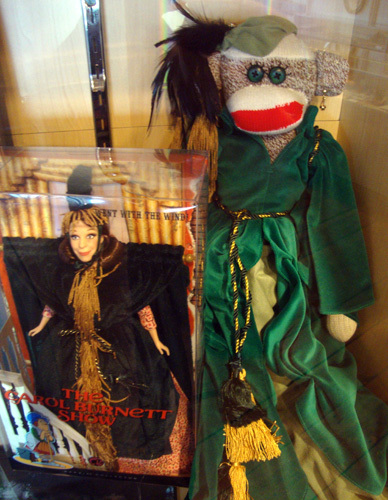 The Gone With the Wind Museum, formally called "Marietta Gone With the Wind Museum, Scarlett on the Square," is where I started my personal celebration of the literature superstar. 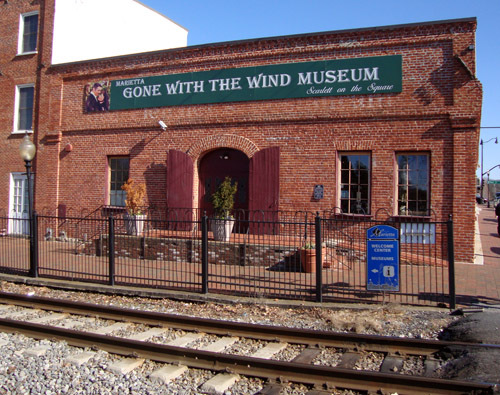 The Gone With the Wind Museum is located in Historic Marietta Square immediately in front of a frequently used railroad track and next to the Marietta Museum of History and the Marietta Welcome Center. The Museum's artifacts are the personal collection of Dr. Chris Sullivan of Akron, Ohio, and ladies and gentlemen, based on what I saw, Dr. Sullivan is quite the avid collector. 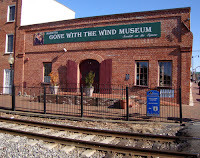 The building is ideal for the Gone With the Wind Museum. The structure looks historic because it is. It's the Old Thomas Warehouse Building built in 1875, which was a carriage house and cotton warehouse. The Museum, operated by the City of Marietta, opened its doors in April 2003 and also will be honoring the 75th Anniversary of the publication of Gone With the Wind during an annual event, this year to take place in June. Check their website for an upcoming announcement about the event. When I entered, immediately after noticing that the movie Gone With the Wind was playing (a nice touch), I was kindly welcomed to the Museum, sold a ticket, and provided with the lay-of-the-land. The self-guided tour begins at the back of the Museum, accessed by a pathway along the right side of the interior of the building. When I got to the back of the museum, I immediately heard the movie soundtrack playing. It was coming from a tiny blue boom-box…not terribly sophisticated, but very nice to hear while exploring. The Museum is packed with copious amounts of foreign edition books and posters, movie memorabilia, collectibles, scripts, autographs, personal items from the estates of Margaret Mitchell (the book's author) and Vivien Leigh (the actress who portrayed Scarlett O'Hara), and costumes (some originals, some reproductions). I'll share a few highlights of the Museum, just rest assured that there's a lot more than what I discuss here. Without a doubt, the shining star of the collection is the Museum's Bengaline Honeymoon Gown. 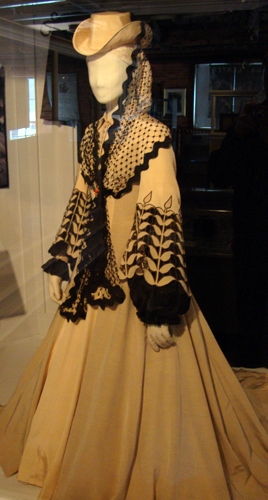 It's the only original dress worn by Vivian Leigh in the role of Scarlett O'Hara on permanent public display anywhere in the world. There are many reproductions on display in other museums, some very good ones, but not originals. Designed by Walter Plunkett, the dress features ivory silk bengaline, Chinese silk, and embroidered sleeves. The dress is an exquisite artifact of Hollywood fashion, to say the least. It's believed that there are only seven surviving original Vivien Leigh gowns from the film and the others are supposedly in a private collection, not on display. The Bengaline Honeymoon Gown is shown in a gallery accompanied by ornate red velvet and wood chairs from the movie set and a jacket worn by Leslie Howard. The lower level of the Museum has an impressive collection of foreign editions of Gone With the Wind, many from Margaret Mitchell's own private collection, some with versions of the classic movie poster, some country-specific text only. The variety is stunning and the global interest becomes obvious through this collection. 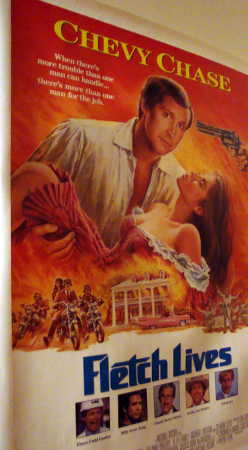 Complementing the foreign edition collection of books is a collection of foreign edition movie posters, as well as a few spoofs of the Gone With the Wind movie poster, such as "Fletch Lives," starring Chevy Chase. The movie Gone With the Wind premiered in Atlanta, Georgia, in December 1939 (to phenomenal fanfare) at the Loew's Grand Theatre. The theatre was destroyed by fire in 1978. The Museum has quite a few artifacts from the movie premiere, including souvenir programs. The Georgia-Pacific Tower stands on that site today, but some of the bricks salvaged from the theatre were used to build the Houston's restaurant at 2166 Peachtree Street, NW (which has the best pork chops I've ever tasted!). 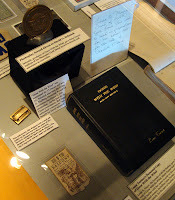 Lana Turner's autographed copy of Gone With the Wind, is also in the museum collection. Lana was one of more than 1,000 actresses who auditioned for Gone With the Wind. Director Selznick presented Lana with a copy of Gone With the Wind, which she had rebound in black leather and the title and her name inscribed on the front cover in gold lettering. There are numerous articles about the auditioning process for the various roles, but mostly about the role of Scarlett. And there are articles that tell the tale of scandal after an India-born British actress (Vivien Leigh) was cast to play the role of a Southern belle in one of the biggest films of its time. 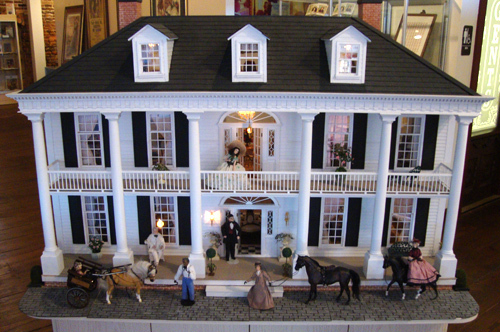 The Museum honors the millions of worldwide fans of Gone With the Wind by including fan-created and donated artifacts. The fan-created items range in size, material, and complexity. A reproduction of the blue dress worn by Cammie King Conlon in the role of "Bonnie Blue Butler" sits in an alcove in the lower level of the Museum (Conlon passed away in September 2010). Fan-created embroidery of Scarlett are located in the upper level of the Museum. And a painted table featuring the four leads adorns the middle of the museum. 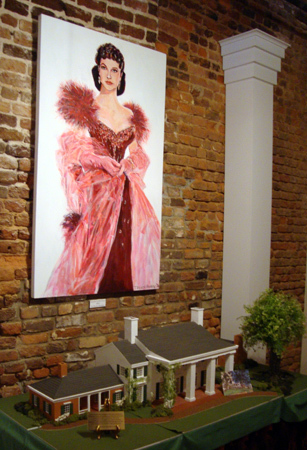 One remarkable fan-created piece is a replica of Tara Plantation, Scarlett's home. It's made of wood and other materials, but mainly of Legos (which I loved playing with as a kid). The Tara Plantation replica was made and donated by Mike Trower. I was thrilled to find that homage is paid to Carol Burnett's "Went With the Wind" skit (part 1, part 2) that aired on the Carol Burnett Show on January 10, 1976. Carol portrayed the character "Miss Starlet"…and she was brilliant! On display are an original drawing of Miss Starlet by the curtain rod dress designer, Bob Mackie; a Went With the Wind Barbie Doll; and a sock puppet dressed as Miss Scarlett. I remember seeing a Carol Burnett Special many years ago when Carol told the audience that Went With the Wind received the longest applause of any skit ever performed on her show. Not at all surprising then and not surprising now. Of note for Georgians, Vicki Lawrence, who played "Sissy" in the Burnett skit, recorded a U.S. #1 hit record in 1973…"The Night the Lights Went Out in Georgia." Hattie McDaniel was the first African-American to receive an Oscar, in this case Best Supporting Actress for the portrayal of "Mammy." Although she gave an Oscar-worthy performance, because of the Jim Crow laws in Georgia, she was prevented from attending the world premiere of the movie at the Loew's Grand Theatre and her image was removed from the souvenir program (under law, blacks and whites could not appear on the same program). Oscar-winning McDaniel was welcomed at the Hollywood premier and was included in souvenir programs outside of the South. At the January 1940 Oscar's, she gave an eloquent acceptance speech and paved the way for future black Oscar contenders. The Gone With the Wind Museum has an original telegraph sent from Hollywood to producer Selznick advising against including McDaniel in the Atlanta premiere. 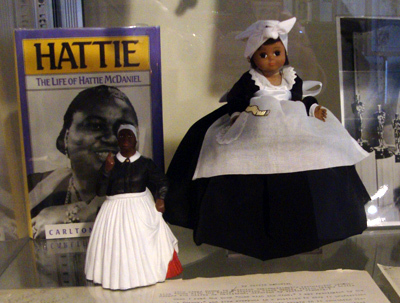 Other Hattie McDaniel and Butterfly McQueen memorabilia are on display. After checking out the incredible collection in the Museum, following tradition visitors exit the museum through the gift shop. 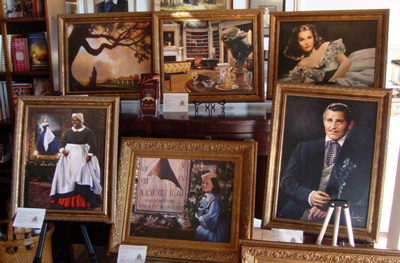 There one can pick up Gone With the Wind merchandise ranging from postcards to copies of Gone With the Wind on DVD and Blu-ray and figurines to limited edition serigraphs on canvas. Personally, I'm fond of souvenir books and I'm very fond of postcards. I've written postcards since I was a child and I think it's nice to send them to friends…they get something in the mail other than a bill and you get to share a fun experience with them. Will Scarlett's charm tempt me to return to Tara? Absolutely…a book of this stature has only one 75th anniversary and I'm anxious to see what the Marietta Gone With the Wind Museum, Scarlett on the Square does at their June event to celebrate the book. this is unbelievable! 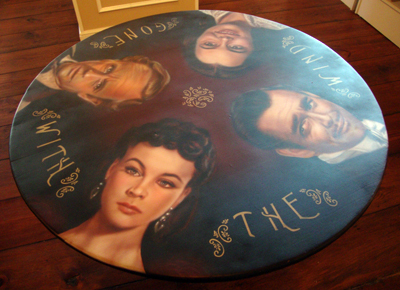 I am probably one of the craziest gone with the wind fans ever! I would give anything to visit this place! I would give anything to own something that Vivien Leigh touched! No matter what people say, Gone with the Wind is a classic that will forever remain in the hearts of Americans and people throughout the world! LONG LIVE VIVIEN LEIGH AND LONG LIVE GONE WITH THE WIND! I am a huge fan too,I have one full room in my home for just my Gone with the Wind collectables,I too would love too visit,and to see the real dress,I own the movie and watch it at least once a month,just think this is the best movie ever!!! !